Leaf Best of Baseball was one of the first products to focus on repurchased cards that gave collectors another shot at some high-end cards. 2015 Leaf Best of Baseball continues with the tradition with more big-ticket items. Each box comes with one buyback piece as well as an exclusive Yoan Moncada card. The range of repurchased cards in 2015 Leaf Best of Baseball is vast. 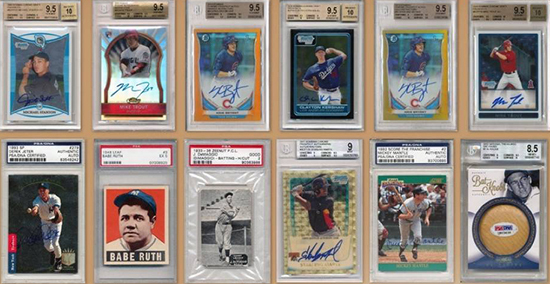 There's a mix of vintage and modern stuff including professionally graded rookie cards, slabbed autographs, super-premium memorabilia cards and more. Collectors can also find full boxes of high-end products. The Yoan Moncada cards add another element to the product. The young Red Sox prospect, who hails from Cuba, is highly touted. One in four boxes has a Yoan Moncada autograph instead of the regular card. 2015 Leaf Best of Baseball boxes have four boxes. Because of the modern cards in it that can turn out to become worthless if you hold on to them it’s a risky product. But from the case breaks I’ve seen Leaf tries to get a good mix of either 2 vintage and 2 modern or 1 very vintage and 3 modern. If you keep expectations that you’ll at least get a $75 card that you don’t already have then you’ll be happy. If my expectation is a $75 card than my jump in price would be $150. Atleast I’ll get half the value back instead of chump change on these other high-end products that you’ll be luck to get a quarter of the box price back. Got a live box break on Steel City and pulled a 9.5 Gem Mint (10 auto) 2014 Topps Chrome Autograph Refractor Jose Abreu /#499. Not sure what the Moncada was since the guy broke it so fast so I’ll update when it gets here. Like Mike said above, the abreu is very modern and while it is nice, I feel like a product at this price point should not have anything serial numbered higher than 50. Even if it is graded gem mint. Also, more vintage cards would be nice. I don’t know how others feel about buybacks, but I always look at them as a chance to get nice vintage cards that I can’t find or afford otherwise. One additional note to my review above. I agree with Mike that with this product you always get something sell-able so you can at least recoup some of your money and that’s more than I can say for most others (How many Topps Tier One boxes have you tossed into the trash because no one wants the box hit?). That’s definitely a big plus. I think the trick with this one (if you’re like me and prefer the vintage cards) is you have to buy a case to get the best bang for your buck.